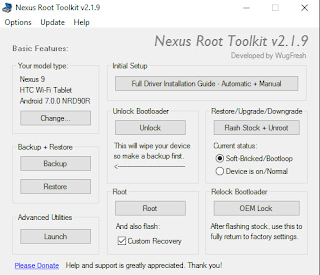 Nexus Root Toolkit is a powerful tool designed for Nexus Smartphones. This latest Nexus toolkit easily unlocks, root and relock devices, as well as flash stock Android releases. All of these operations cause complete data loss, and as such, Nexus Root Toolkit also provides possibilities to backup content prior to performing any change. This tool contains all the files you need to unlock and root your device, or flash it back to stock and re-lock it. You can also use this latest tool to backup all your user apps, system apps, and app data, and easily restore them later in one click. You can flash or boot any IMG files you want to any partition on your device, as well as flash any current or future stock android release. Now making updating your device an easy way, and now with the latest release, you can configure your drivers automatically within a seconds. Unlock and root your device in a few clicks. Lash it back to stock and re-lock it. Backup/restore all your important data. Grab screenshot and screen record. Fastboot erase and format partitions. Now when you have the toolkit, it is time to use it on your device. To help you make the best use of this tool, we have provided a simple guide to root your Nexus. These set of instructions will walk you through the difficulty of rooting your device. If you are a beginner, this guide will help you to root your phone safely using Nexus root toolkit. Download and install the Nexus root toolkit at the given link. The tool will launch automatically once it is successfully installed. Select your model and the Android edition. You can find your mobile details in “settings” followed by “about device”. Enable USB debugging by going to “settings” followed by toggling “developer options” to “ON” and then checking the “USB debugging” box. Connect your Nexus device with the computer via a USB cable. Wait for the Windows to install the drivers and then click “Ok”. To prevent any loss of your data, you need to backup it beforehand. You have a backup option right in front, click on it to commence. In order to proceed, click “Unlock”. Unlock bootloader on your Nexus when asked. Your device will now be reset to factory settings. Before continuing, make sure you have enabled USB debugging on your device. Now, choose if you want to enable CWM on your device or not. It is recommended you switch it off. Simply select the circle saying “Do not flash CWM” and click “Root”. Launch the SuperSU app on your Nexus. Update the SU binary. After that, launch the BusyBox app, and you will be prompted to give root permission. Allow root permission and then click install. The Nexus Root Toolkit is compatibility with Windows 10, 8, 8.1, 7, Vista and XP on either a 32-bit or 64-bit setup. So just tap the given link and download this latest Nexus toolkit for your PC Windows for free of cost. Just tap the link and your download file start within seconds.